With opening a few months away, The Vineyards already is generating anticipation as Southern California’s newest upscale and pedestrian-friendly shopping and entertainment center. What’s more, The Vineyards will also feature some of the region’s latest and most sustainable operating systems and eco-friendly fixtures. Rooftop solar panels will offset tenant electrical loads, power LED lights in common areas and send excess power back into the grid. Giant underground tanks have begun to capture and clean stormwater that will irrigate the carefully designed landscape, which happens to include rows of actual wine grapes. 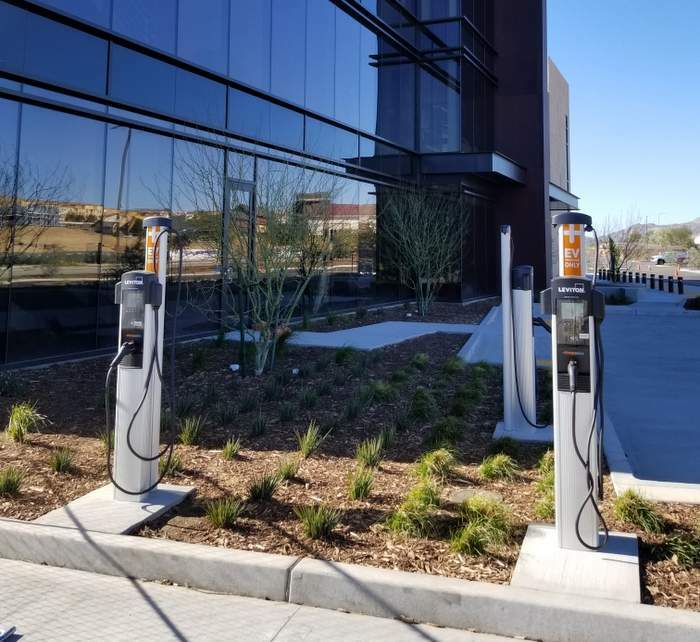 Mobile app-connected electric vehicle charging stations will be strategically placed throughout the parking lots, including two installed by Whole Foods Market, which will open a new flagship location in the spring of 2019. And interactive kiosks will help visitors to The Vineyards learn and appreciate the various ways that sustainability has driven the project’s design. Shapell Liberty Investment Properties, The Vineyards developer, has carefully designed and implemented a range of features and construction methods to ensure a lower ecological footprint and to create a thriving community hub that will become the focal point for the surrounding north Los Angeles neighborhood. To celebrate and promote the sustainable features of the project, Shapell Liberty will seek LEED certification, a rare feat for developments of this scale – particularly shopping centers. The development will also seek SITES certification for its extensive landscape design, a badge of sustainable design comparable to LEED requirements for buildings. Initially, there will be 15 charging stations available on a first-come basis when The Vineyards opens, with plans for up to 85 total electric vehicle (EV) charging stations as demand for those spaces increases. Shapell has selected ChargePoint to supply Level 2 charging stations at The Vineyards main shopping center. A series of large underground cisterns already installed at The Vineyards will capture and filter rainwater runoff at the project to re-use for irrigation purposes. The Vineyards is a mixed-use development at the intersection of Rinaldi Street and Porter Ranch Drive, featuring a pedestrian-friendly design to provide a world-class gathering and entertainment location. With complementary luxury apartments, hotel and office space, The Vineyards will be the premier open-air, mixed-use lifestyle development in the north San Fernando Valley. Design elements of the shopping center include a “main street” and central green area that will host community events, and a 4,000-square-foot community meeting room. The project includes a recently completed three-story Kaiser-Permanente medical office building scheduled to open in early 2019, a 100-room Hampton Inn & Suites hotel targeting to break ground in 2019, and a 266-unit luxury apartment community that is under construction and slated to open in 2020. Major tenants include Whole Foods Market, AMC movie theaters, Ulta Beauty and Nordstrom Rack.